Stories of Prince Hall & Mainstream interaction are popping out everywhere. And the beautiful aspect of it all is that there is great appreciation and joy at this intermingling. Brotherly love and affection prevail and every moral and social virtue cements Brothers of different traditions. The Beehive reported recently the story of the Mainstream Grand Master of Michigan visiting a Prince Hall Lodge with many of his Michigan Brethren in “Bridging The Gap.” The latest example of this joyous cross visitation comes from a personal friend, Brother Tofique Fatehi from Mumbai, India. Brother Fatehi and I met on the Global Fraternal Network in the late 90s. Soon, thereafter, Brother Fatehi journeyed to Massachusetts to visit his son who is living here. When an opportunity to see the Paul Revere Colonial Degree Team perform in Southern Maine arose, Tofique took the opportunity to accompany us and see US Mainstream Masonry. 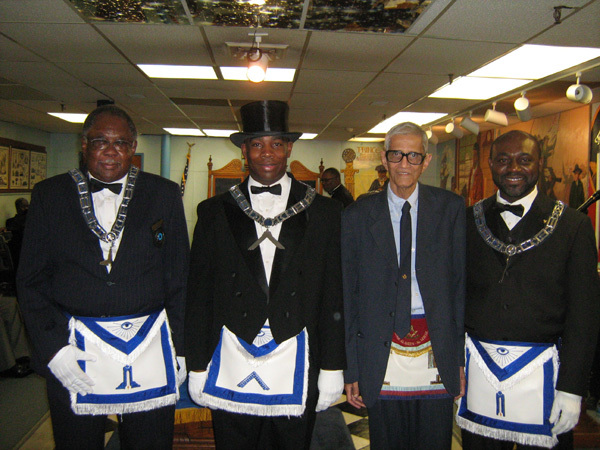 Tofique returned this fall for another family visit and got in touch with me to see about visiting a Prince Hall Lodge in Massachusetts. I turned him over to the capable hands of Worshipful Jim Bennette of the Grand Lodge of Massachusetts, another good friend who has a strong relationship with Massachusetts Prince Hall. While in Massachusetts I visited a PH Lodge in Boston. Bro. Fred Milliken (now in Texas) arranged for my introductions. I attended the Widow Son Lodge in Dorchester (South Boston). Tofique reports that they rolled out the red carpet for him and he had a great time and was impressed by their ritual & knowledge. All this goes to show that it is time now for all the old barriers to be taken down. We are in the second decade of the 21st century and the manner in which different races and cultures have heretofore interacted is a thing of the past. The future brings us all closer together in brotherly love and affection. So let us all do our part to see that the state of Freemasonry in the world opens up into a celebration of its diversity and a new age of the expression of what Freemasonry truly exemplifies. such a good news to hear about that i wait to see that of africa unveiling freemason. Mostly in my country nigeria alot of things are under secrecy which is not too good i wish i can find a lodge in my country where i reside. Mostly in my state, rivers state. I will be very very happy. I liked this display of warmth and affection among the brethren cutting across an ocean of divisions amongst the human beings. Nice to see your visit being covered..Great going Brother. Trust your representation will continue to do us proud. LAHORE – Top government officials in Punjab are perturbed over a legal move by the Freemasons that can ultimately result in the loss of prime property currently under the possession of the Punjab government, Pakistan Today learnt on Friday. It was very entertaining to read all the news and comments. and distant places. wish him many years of Masonic activities with his masonic friends in his native place as well as abroad. that binds us. It also shows the Universality of the Craft. In addition to my last comment of Dec 2011, I was indeed happy to note the visits Bro. Tofique Fatehi undertakes to Various Lodges around the globe which strengthen Masonic Circle throughout the universe. The visits to PH Lodge in Boston & Widow Son Lodge in Dorchester (South Boston) is one case out out of very many visits Bro. Tofique Fatehi has undertaken to various Lodges. His knowledge on Masonic subject is voluminous. His Sunday Emails to Brethren on various Masonic Topics is educative and He strives to give still better results thus enlightening the minds of ever Masonic reader. God Bless.